Stokes County is located on the Virginia border, north of Winston-Salem. Its county seat is Danbury. The terrain is hilly, but the Sauratown Mountains cut across the center of the county and dominate the landscape. Like most counties of the rural Piedmont, Stokes is strongly Republican, with 47% of voters registered to that party. 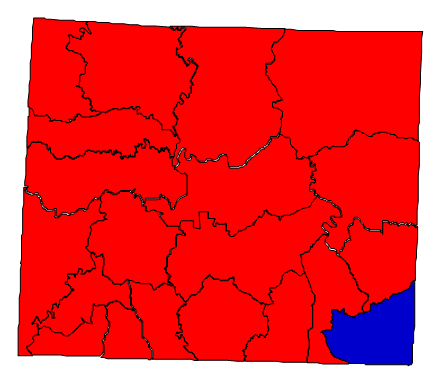 Forecast: Stokes County has been solidly Republican for a long time. But hatred of President Clinton’s policies caused the county to swing massively to the right in 1996. Since that time, it has consistently given Republican candidates two-thirds of its votes. The growth rate during the 2000s was a meager 6.02%, so this is not likely to change anytime soon, and none of the demographic changes in the county are noteworthy. It is expected to remain solid Republican.